• A Field Guide for Southeastern wildflowers. • 300+ wildflower photos from hiking trails. • Identified by common name, botanical name, month of year, and location. • Complete (sortable) index allows quick finding of individual specimens. • Easy click to enlarge feature. to wait on internet connections and slow transfer of data. 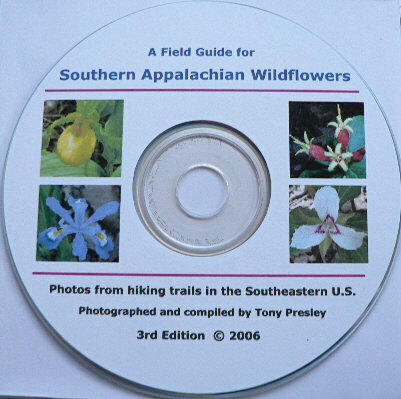 • Excellent for identification, teaching, or wildflower presentations. • Makes a great gift for anyone who enjoys wildflowers! • Buy Now for fast shipping! Only $10.00 including shipping! - USA only. Charge to your choice of major credit cards by clicking the PayPal "buy now" icon below! PayPal is the most used and respected Secure payment method on-line! and I will send you instructions for sending your payment. Scroll up the page to order!